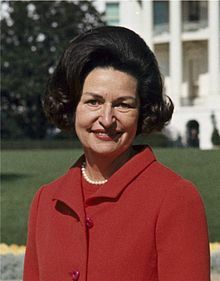 Lady Bird Johnson would be celebrating her 100th birthday today if she were still with us. Catherine Robb’s eyes blurred with tears and she paused, overcome by the emotion of trying to find the right words to express how much she misses “Nini” – the affectionate name she called her grandmother, Lady Bird Johnson. After all, the nation’s former first lady, catapulted into history after President John F. Kennedy’s 1963 assassination in Dallas, came closer than she ever expected to attending her 100th birthday celebration Saturday. She died at her Texas Hill Country ranch in 2007 at age 94. “My grandmother probably never thought she’d get that old. After all, her mother died very young when my grandmother was only 5,” said Robb. By comparison, Lady Bird founded the National Wildflower Research Center in Austin on her 70th birthday and was still swimming laps in her late 80s. Only one other presidential wife, Bess Truman, lived longer. In 2002, Lady Bird was slowed by a debilitating stroke. She completely lost her voice and macular degeneration claimed her eyesight. Her centennial celebration is being commemorated by the U.S. Postal Service with the release of a stamp featuring her in a canary yellow gown from her official White House portrait; a wildflower sculpture made in her honor; and a massive, multimillion-dollar renovation of the LBJ Presidential Library, to be unveiled Saturday and that for the first time features excerpts from 643 hours of telephone conversations that President Johnson secretly recorded of his political dealings in that era. I don’t really have a point to make, but like Catherine Robb, I had a grandmother that I was very close to, so reading this story got me a little misty-eyed as well. Happy birthday, Lady Bird.